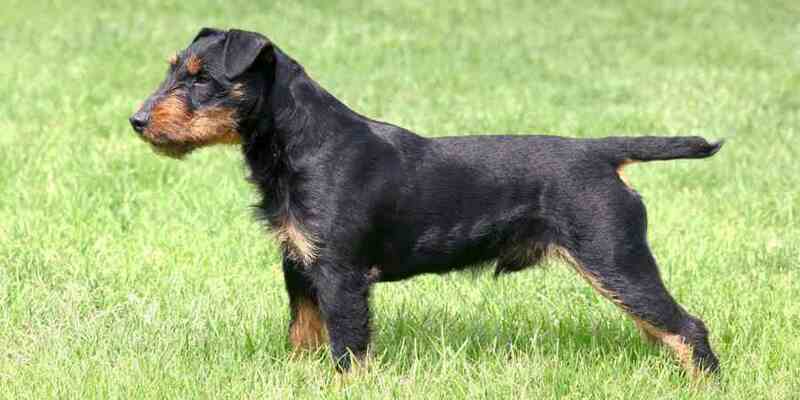 The Jagdterrier is a versatile hunting dog from Germany. In German, jagdterrier literally means “hunt terrier.” He is particularly suited to hunting under the ground and as a flushing dog and is relatively small, compact, and well-proportioned. His dense coat, either hard and rough or course and smooth, is usually black and tan, but can be dark brown or grayish-black as well. The tan markings are on his eyebrows, muzzle, chest, legs, and at the base of his tail. He could also have small white markings on his chest and toes. Beyond regular weekly grooming, the occasional bath will keep your Jagdterrier clean and looking his best. Grooming can be a wonderful bonding experience for you and your dog. The strong, fast-growing nails should be trimmed regularly with a nail clipper or grinder to avoid overgrowth, splitting and cracking. Ears should be checked regularly to avoid a buildup of wax and debris, which can result in infection. Teeth should be brushed regularly. The majority of Jagdterriers are healthy dogs. Working with a responsible Breeder, those wishing to own a Jagdterrier can gain the education they need to know about specific health concerns within the breed. Good breeders utilize genetic testing of their breeding stock to reduce the likelihood of disease in their puppies. Options for exercise could include play time in the backyard, preferably fenced, or being taken for walks several times a day. Exercise can also come in the form of indoor activities, like hide-and-seek, chasing a ball rolled along the floor, or learning new tricks. Certain outdoor activities like swimming, hiking, or retrieving balls or flying discs can provide a good outlet for expending energy. If you live in an apartment, even short walks in the hallways can give your dog some exercise, especially during inclement weather. Training for dog sports like agility, obedience, and rally can also be a great way to give your dog exercise.